When it comes to your precious home garden, you should not compromise. Having the most durable, eco-friendly and professional tools and accessories is absolutely essential to your success. That's why it's time to invest in a premium, pro weed barrier landscape fabric that will save you time, effort and your hard-earned money in the long run. The ECOgardener elite weed control mat is designed with great attention to detail, in order to make sure that your plants are protected from weeds and that your soil retains its value. 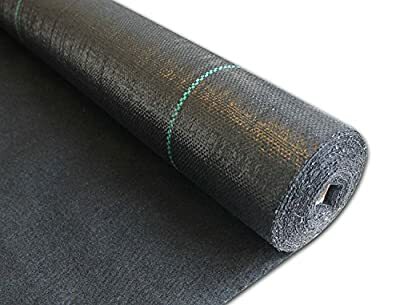 By combining the advantages of woven and non-woven weed barrier fabric, ECOgardener has created the strongest, most advanced and most eco-friendly alternative for your home garden. We, at ECOgardener, have designed our exclusive weed barrier fabric with your maximum convenience and satisfaction in mind. It combines the strength of heavy-duty, woven fabric with the moisture retention of non-woven fabric in order to provide extreme weed control and conserve soil moisture. In addition, the pro garden weed barrier cloth is tremendously durable due to its thickness and high-quality materials. Not only is the ECOgardener convenient and sturdy, it is also ideal for both cold and warm season thanks to its advanced, two- layered needle punched fabric. You don't have to be an expert or waste money on costly professional to set up the ECOgardener, eco-friendly and convenient weed barrier landscape fabric. It's easy to cut, lay and install without any hassle. Being the top choice of professional landscape designer, our durable and thick weed block barrier is the prime choice for your garden! ECOgardener is a family-owned company, dedicated to providing you with superior- quality, eco-friendly and efficient solutions to your every-day problems. Sharing your passion for gardening and the environment, ECOgardener's designers are committed to making the world a healthier and better place. DISCOVER THE PROFESSIONAL GARDENING SOLUTION - The ECOgardener ultimate pro weed barrier landscape fabric is here to make your life easier and 100% hassle-free. Designed to provide unparalleled weed control, this premium weed barrier fabric will skyrocket your productivity and efficiency! SUPER-EASY TO INSTALL & SET-UP - You don't have to be an expert or call in expensive professionals in order to set up the elite ECOgardener weed blocking fabric, since it is light enough so that you can carry and cut it and also heavy enough to protect your garden. YOUR SOIL HAS VALUE & WE KNOW IT - Our exclusive garden weed control mat is designed to let air and water through, thus conserving your soil's moisture and preserving its value. The ECOgardener simple and easy gardening solution is going to keep weeds away without blocking air or water. WEED BARRIER FABRIC MADE TO LAST - The heavy-duty, durable and sturdy design of the ECOgardener pro landscape weed barrier will provide you with premium weed protection for a very long time. Helping you to reduce chemicals so you can do your part for the environment too! 100% SATISFACTION OR YOUR MONEY BACK - We, at ECOgardener, believe that you deserve the most advanced, durable and professional solution for your home garden. That's why we confidently offer a 30-day, hassle-free, full refund guarantee on our stunning weed barrier fabric!